Traders at a Leicestershire town's indoor market have accused the council of putting its current venue up for rent behind their backs. 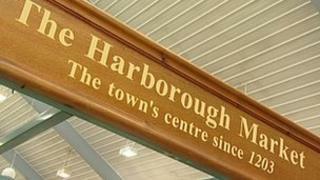 A consultation has started over plans to relocate stall-holders from Market Harborough's Market Hall to Fox's Yard to save money. A property website has listed the venue as available for lease to a major retail chain or shopping centre. The district council said the advert had only been placed to gauge interest. John Cleaver, chairman of the town's branch of the National Market Traders Federation, said: "I've wasted all the funds of the market traders fighting our case and we've had donations from the public. "It's a bit like getting hit in the gut when you find out they've already put it up for lease." The district council said no final decision would be made until the consultation had come to an end later this year. The current market is open every Tuesday, Friday and Saturday and has 40 different businesses spread over 72 stalls.